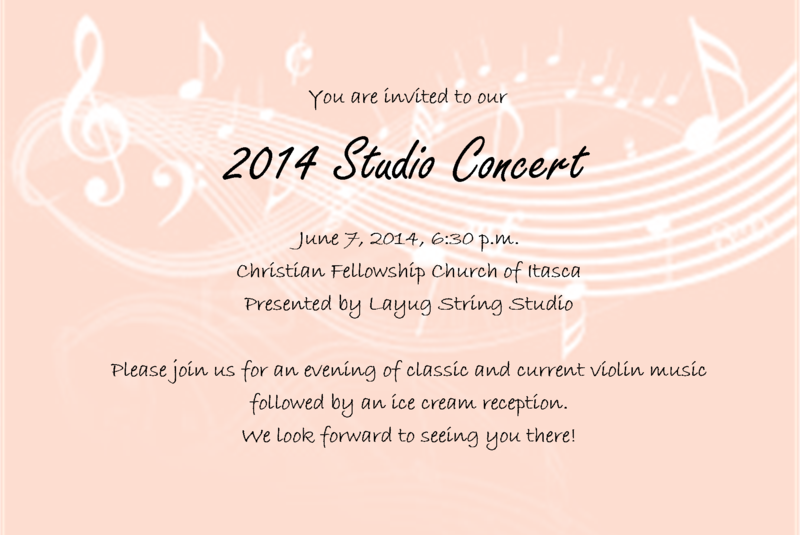 June 7, 2014 6:30 p.m.
Ice cream reception to follow. Please feel free to invite guests. You are welcome to use the graphic above or this link. All students should plan to arrive around 6 pm for the 6:30 recital. Tuning will happen between 6:10 and 6:20 and we’ll use the extra few minutes to get settled and ready to play! Please bring your family’s favorite ice cream topping for the reception! Piano rehearsal times will be Thursday May 29 (Itasca) and Monday June 2(Streamwood), with an optional extra practice on Thursday June 5 in Streamwood. Please see your email for details and individual rehearsal times. Here’s a preview of the cards for our two contests this fall! The twist: Instead of a year-end prize, you can win music throughout the school year! Every 15 silver stars, 12 gold stars, or 10 bonus stars, students can pick a CD out of my “music box” (and yes, I know it’s the digital age, but I haven’t figured out how to legally give away downloads yet! :)) There will be a good mix in there, from symphonic to fiddle to probably some soundtracks or who knows what–we’ll see what I come up with; hopefully something for everyone! The scale contest is something almost all of the intermediate-level students are working on now. This is a systematic way to work through the 2-octave scales and arpeggios, becoming comfortable in many keys and at a consistent level of scale performance. It is excellent preparation for the “standard” 3-octave scales that students will use at advancing levels. 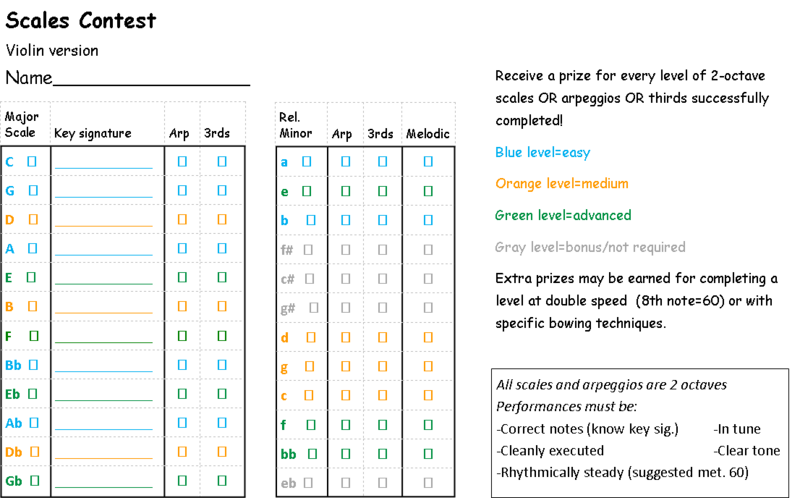 For the contest, all the 2-octave scales and their corresponding arpeggios are divided into levels according to difficulty. Students can win prizes each time they complete a level for either scales OR arpeggios, or variations such as thirds and different forms of minor. Right now the prize box contains everything from pencils and bookmarks to baseball cards to packets of tea, coffee (decaf!) and hot chocolate–and I’m always looking for fun things to add! Ice Cream Week is coming up! We will have our sundaes in lessons during the week of August 26-31. Please let me know if you need to adjust your lesson time for the new school year!